Whoa, I totally forgot to make a post last night. What I meant to write is that I have the day off today. Yay! Long weekend! In honour of the leap day this year, EA gave everyone a day off in their development studios in BC. I just woke up and will be going to catch an early showing of Semi-Pro starring Will Ferrell. I hope everyone enjoys their weekend! Have you ever paid $37 for two bumper stickers and a fake parking permit? I haven’t but I’m considering it and I don’t even own a car. If I do pull the trigger on this purchase, you can definitely label this under the geek section. I want to buy the official Black Mesa parking permit kit offered by the Valve store. It contains two bumper stickers and a vinyl, static-cling Black Mesa parking permit. At this point, you will probably fall into two categories: you understand what this (and how it cool it can be) or you have no clue what I’m talking about. Black Mesa is the fictional research facility featured in the Half-Life games universe. All such games have been held in high regard, with Half-Life 2 topping many lists as “the best game of all time”. The parking permit is kinda stupid if you think about it. How many people approach your car in that close proximity? I don’t park cars on the street too often, which is probably the most noticeable it might be. A bumper sticker might be more visible but I don’t care for the ones included in the kit. Even if people saw it, how many of them would really get it? Oh, so I guess I need to explain why the kit costs $37 (before tax). The kit actually selling for $9.95 but they force people to use a FedEx shipping option if you live anywhere outside the US. The FedEx option is $27!!! So it costs the same amount to ship something to Australia as it does to Vancouver, even though Valve is located in Seattle. A friend of mine suggested that I buy more stuff from the store to make the shipping more worthwhile. I guess that makes it a better deal. Now that I think of it, the head crab plush toy would be a more practical item to buy. They don’t make it yet, but thing I would like the most is a Black Mesa hoodie, just like Alyx wears. A few people have made their own but they look off since most of them screw up the logo somehow. I wonder if I can get one silkscreened for cheap, like I did with the et.com t-shirts. About five months ago, I wrote a post where I detailed my purchase of a full-spectrum bulb for my desk lamp at work. I was attempting to see if this new bulb would prevent the “winter blahs” from affecting me. With nearly half a year in front of the lamp, eight hours a day, and almost a full winter behind me, I think it’s time to make a quick, informal assessment. In short, yes, I think I have felt better this winter than the previous one. I feel less tired, less moody, and more cheerful during the day. This winter hasn’t really bothered me that much. Of course it would be ridiculous to conclusively say this was all because of a single light bulb. There are a number of other factors that might be at work. I’m in the second year at EA and things are going well at the studio. Last year wasn’t horrible either but I was still a rookie and kinda nervous about things. Also, this time last year, the game was in rough shape so there was a lot of concern on a daily basis. My current project is going much smoother. Weather wise, maybe there were just more sunny days and less rainy ones this winter. I can’t be bothered to look it up but it sure feels like that was the case. Placebo effect or not, I know for sure that I’ve got the whitest, purest light on any desk around the studio. In a previous post nearly a year ago, I wrote about how I lost my watch because I’d been holding the strap together with tape for about three months. Well, working backwards, it’s been considerably over a year now since I first applied clear tape to my busted watch strap. Initially, I had intended it to be a stopgap measure until I bought a new strap. Somehow, either through laziness or some other word I can’t be bothered to look up, I never did get a new strap. Now, I actually did visit the Swatch store in Times Square in New York around midnight in August of 2007, looking for a new strap. They brought out a couple for me that fit my particular model but none of them looked good with my watch. I find it odd that over the course of a year, I wouldn’t go to the Swatch store in Metrotown but I was ok with visiting the one in Manhattan. So here we are. In fact, it got worse a few days ago. A second rip developed in the strap, so now I have to tape it in two places. Only a handful of people have commented on my ghetto watch strap. I wonder how many have noticed, only to have not said anything. I wish I could show you what the strap looks like right now but I can’t seem to find my digital camera. I hope my mom didn’t sell it for drug money. Anyways, I think this weekend is the weekend where I go to the local Swatch store. Sorry but no post for today, I am suffering from severe monitor problems. Bah! New computer setup tasks took up my entire evening tonight, leaving no time for a longer post. Instead, I invite you to read about the Corona series of spy satellites. First launched in the late 1950s, these satellites actually dropped film from high above the earth to waiting aircraft, which grabbed the film canisters while in mid-air. Having ordered a new computer late Thursday evening, it finally arrived at my home today. It would have got here yesterday had Purolator not put it on the wrong delivery truck on Monday morning. I got the computer without an OS and an optical drive since I wanted to save a few bucks. I have an MS friend down in Redmond who gave me a copy of Windows XP. I’m also reusing a DVD writer I have from my old computer. I forgot how long and involved it is to setup a new computer. Installing the OS can be a chore and setting it up just right takes forever. I started in earnest around 9pm and I only got XP installed and managed to install the graphics card drivers. Two hours and a bit just for that. My installation of XP is already with service pack 2 yet when I checked for updates, I still have over 90 critical updates to download and install. I wish I could spend all day tomorrow to continue my setup. In any case, I am going to bed. I’ve had this pet peeve for a while but I’ve only now expressed it in blog form. It’s got to do with lineups and people. This pet peeve can happen anytime you have a service counter, people working that counter, and people lining up to receive a service. This most commonly happens in fast-food lineups but can also occur in other situations, like customer service lineups. There are mainly two ways the lineup can form: the wrong way and the right way. I will discuss the wrong way first. Refer to the diagram below. So what do you see here? There are three people working the counter and three separate lineups, with each lineup waiting for an individual clerk. Looks fine right? Wrong! This situation does not take into account the temporal aspect of when a person enters the lineup and does not guarantee fairness in wait times. Consider a example for further discussion. Let’s say I enter the lineup on the left-hand side, in the number three position. The center lineup already has three people in it. A full two minutes later, a person enters the lineup on the right hand side, also sliding into the number three position. Since I lined up two minutes before righty, I should in all fairness get served first. This arrangement, however, does not guarantee that. Imagine that clerk #1 is new or that clerk #3 is super efficient. Or, imagine that the dude at the front of my line has no idea what he wants and is asking the clerk all sorts of questions. My line starts to suffer in terms of people served per time unit. While I’m being delayed, righty, through sheer luck, gets served before I do, possibly significantly before. I know this happens often because I’ve had this happen to me many, many times. Sure, I’ve also benefited from the improper lineup configuration but I shouldn’t have had that good fortune. Also, you’d be naive not to think people in the slow lineup don’t notice how slow their line is and how much faster the other ones are. People do notice and sometimes even try to switch lines. Ideally, the best situation is in which every person is served in the order in which they arrived, relative in time to everyone else waiting. In computer hardware/software terms, that’s a FIFO lineup, first in first out. How do you enforce such a priority scheme? Look at the right way below. The solution is quite simple. There is only one lineup, not three separate ones. The person at the head of the line always gets the next available clerk. This configuration ensures that everyone is served in the order at which time they entered the lineup. It guarantees that no one who gets in the lineup before you will be served before you. Of course, this won’t guarantee you’ll get your food (or whatever) before the guy behind you. If you order some crazy special Big Mac with all sorts of custom mods, then don’t be crying if the dude behind you gets his medium fries first and takes off. If you think I’m the only one worrying about this, consider these two common lineup “helpers”. First, consider lineups where people are controlled and herded with velvet ropes (or similar items). They do this because they don’t want people forming several different lineups. It enforces a single line, in the shape that they want the line in. It also enforces fairness. First in the line becomes first to exit the line. Also consider the “take a number” helper. People take a number and wait to be served when their number is called. The numbers go up to a certain point and then roll back around. The numbers are also called in an increasing manner. Again, this is to ensure temporal fairness. You are guaranteed to receive service before the guy that got there after you. Lastly, let me tell you about a time I experience a “wrong” lineup. It was at the McDonald’s at Waterfront Centre. There were two clerks, and two lineups, each waiting for a clerk. I was dismayed to see this so I just chose the line that looked like the best one to be in. While I was waiting, I tried to actually consolidate the lines into a single line. No one listened to me and I got some weird looks. This is why our society is crumbling. I leave you with a request. For the good of civilization, if you’re ever the first person to form a line, stand an equidistant amount from each clerk that’s working. Do that even if it means there is no clerk directly in front of you. My experience is that people naturally understand they need to get behind you, so you’ll force fairness on the rest of the lineup behind you. If someone lines up parallel to you, get their attention, give them a look, and motion to the place behind you. Come on people! We can do it! In grad school I wrote a post once about being the last person on the planet. I explored how I would survive in such a situation. 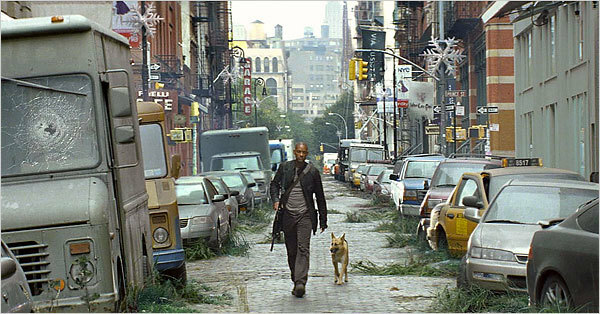 I’d like to explore a similar topic but this time in the fictional universe of I Am Legend. Originally a book by Richard Matheson, it also has been translated into film three times now, most recently with Will Smith. While each film changes the details slightly, for the purposes of this post, I will go with details found in the latest movie. I do so because it offers slightly more information than the book for certain things and because I feel like getting jiggy with it. Ok, in such a universe 90% of the human population is killed by a mutating virus that was supposed to cure cancer. The virus is spread by contact and also through the air. 5.4 billion people die from the virus alone. 9% are infected but do not die, instead they are changed by the virus. These people no longer exhibit normal, rational human behaviour. They degenerate into primal behaviour, showing mostly rage. They also develop an odd adversion to UV light, which can kill them. 588 million people are turned into such creatures. The remaining 1% of the world is partially or completely immune, numbering about 12 million. To completely honest, if such a thing did happen, odds are I’d be in the 90% group. You’d have to be extremely (un)lucky to be in the 9% group and horseshoe/rabbit foot lucky to be in the 1% club. There actually wouldn’t 12 million immune humans left because those people would succumb to disorder, chaos, lack of nutrition, other human ill-will, and not to mention being attacked by the infected. Anyways, for the purposes of this post, I am in the 1% group, completely immune, meaning I have immunity to airborne and contact methods of transmission. I technically could be not immune and be a survivor but that would be nearly impossible given the circumstances. So, how would I survive such a calamity? Let’s go a-thinking! The first couple weeks would be critical and probably the most difficult. As the virus spreads worldwide, people die off in massive numbers. I’d have to watch that happen. Civilization completely breaks down all over the planet. Probably quite quickly there is chaos at unprecendented levels. My only priorities in life become food, shelter, and safety. For food, I assume that I can, for at least a year, forage in supermarkets and other places for meals. Beyond that, it gets interesting but I’ll address that later. The biggest concern is safety. As things go to hell, I am convinced I’ll also face human threats. Perhaps I’m being cynical but I believe there would be other immune people who would want to kill me for anything they valued. For the record, I would not do such a thing to other survivors. So in my mind, I’d have to fight off a few crazies. Last but certainly not least, there’s the issue of the infected. They’d roam the planet at night and if they got wind of me, they’d try to kill me with the ferocity of a lion. I cannot imagine how I would survive without procuring and learning how to use a firearm. It’s a given that I’d need a gun/rifle/carbine and become very good with it. For the thousands of bullets I’ve fired in video games, I need to fire real ones to save my life. The risk would be initial the days or weeks where I’d face threats but not have a firearm. I suppose I might use interim weapons like a baseball bat but getting to my first firearm would be crucial. If I had my choice, I’d go for an M-4 or HK416 with a 9mm sidearm for backup. The issue of shelter is an important one. I’d need somewhere to live, eat, sleep, cook, and reflect. Where I would do those things would need to be safe. With the infected coming out at night, my shelter would either have to resist their attempts to breach my home or it would have to hide my presence. Again, the first couple of weeks are critical. How many of our current homes are secure from such possible attacks? I think initially, I would have to spend my nights in a more safe location. I’m not sure where I’d go, maybe a bank vault. Are bank vaults are airtight? Wherever I choose to spend my nights, it would have to be defendable or hide my presence completely. Also, whatever door or window I open to get out would have to open out into directly sunlight. So for a while, I’d have to split my time between a daylight home and a nighttime home. I would try to consolidate the homes though. I would either move all my crap into my night home or spend the daylight hours securing a normal house so that it would be ok to be in, even at night. To do that, I’d have to learn how to use tools I’ve never used before. I’d have to procure construction materials like wood or more likely plates of metal. If I did choose a normal home, I’d pick a smaller house with wide open spaces around it. I’d hide my existence for as long as I could. That would mean blacking out all the windows and making very little noise at night. I think in the end, if I could survive the first few chaotic months I’d be ok in the long-term. The key would be getting food on a regular basis, getting to that first firearm, and finding that first secure location where I could be safe at night. If I could do those things, I’d make to the steady-state where there is no longer chaos simply because are so few people left. It would be me and the infected. In the long-term, I’d still have lots to worry about. Every night, the infected walk the planet, looking for food and looking to kill. Even in the daytime, I could stumble into a building looking for beef jerky, open the wrong door, and find a darkened room full of infected. I could get sick. I could get injured and not get back to my home by night fall. I could be driving and have an accident. I could run out of food and then be forced to grow my own. I could run out of gas for my portable generators. The one question I have is, would I actively hunt and kill the infected during the daylight hours? Book Neville did but movie Neville didn’t. I think for the first few months while I was just trying to ensure my survival, I certainly wouldn’t. If I got settled though and if I felt more at ease about my survival, I think I would be tempted. I think I might do it out of sheer boredom. I might even derive some morbid satisfaction out of it. Hunting infected would increase the risk to my life drastically. Even hunting in the daytime could mean going into buildings where no light reached and I wouldn’t know what I’d be facing. Lastly, beyond survival, what would my purpose be in life? Find a cure to the infection? I’m no scientist so I doubt I could do it even if I tried. Contact other survivors? Yes, I could try that with possibly radio communcation, just like in the movie. I think mostly likely, I would just document what happened and what happened to me. If I could do that and live as long as I could, that’d be ok.